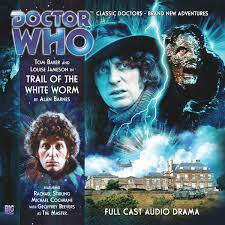 The first run of Big Finish’s The Fourth Doctor Adventures nears its end, its two-story conclusion opening with ‘Trail of the White Worm.’ When the Doctor and Leela arrive in 1979 Derbyshire and get caught up in a hunt for a missing local girl, they soon discover that the source of the legend dating back to Roman times of a great white worm that takes animals and children for food at Dark Peak Gap is alive and well and that the Doctor is not the only renegade Time Lord involved in the hunt. Even though the titular beast ends up being something quite non-terrestrial in origin, the description of the curse surrounding the worm is quite robust without ever becoming burdensome. A rebellious youth named John Lambton originally caught a presumed lamprey while enjoying a spot of fishing rather than attending church, throwing it in a well as he left to join the Crusades. With John away, the worm grew to immense proportions and poisoned the well, ruined local farms, and destroyed his family’s estate. John did return to seemingly kill the worm, but the next nine generations of his family’s patriarchs would all come to meet untimely and unexpected deaths. Of course, the curse itself is not necessarily relevant to the story which clearly focuses on the worm instead, but it does help to give a sense of scope to and better flesh out the creature’s lengthy history within the story’s context. Of course, the big selling point of this tale as shown on the cover art is the re-introduction of Geoffrey Beevers’s Master after a lengthy break from the role. As is usual, the Master adopts an alias and plays coy to gain the confidence of those in power around him before revealing his true intent, and Beevers is absolutely perfect in recapturing the quiet but sinister menace of his malformed incarnation. Unfortunately, ‘Trail of the White Worm’ does suffer somewhat from being the first of a two-part story since the Master himself is hardly a focal point, instead choosing to set up the iconic foe as a more menacing presence for the concluding tale. In fact, the vast majority of the story seems as though it was originally intended to be a standalone affair content with the mystery surrounding and investigation into the white worm, only for the last few moments to dramatically increase in pace to set the scene for the conclusion without necessarily paying off the preceding two episodes’ worth of story satisfyingly. Obviously ‘The Oseidon Adventure’ has the opportunity to tie back to these events to offer a fitting resolution, but on its own the sudden shift in narrative is somewhat jarring. These first few audios have showcased the great rapport between the Doctor and Leela, and that certainly continues here even as the two find themselves separated quite early in the story. Baker is at his charismatic and witty best as he undertakes his own exploration into events, and the presence of the Master is met with appropriate if somewhat restrained resolve to get across the inherent menace of this foe to anyone listening. Leela, following the past few stories that have showcased her fierce intelligence, truly gets to let her physical side loose, her excitement from coming across a new foe and even besting a tank exhilarating to experience. If the script is somewhat uneven and ultimately straightforward, the performances of these two alongside Beevers help to steady the overall journey. Even with the first cliffhanger spoiled by the cover and the somewhat uneven pacing, ‘Trail of the White Worm’ is a suitably enjoyable tale buoyed by its actors and excellent sound design that certainly does nothing to detract from the overall anticipation for the true season finale.